The Boston public school system is grappling with declining state educational aid, a trend that is forcing the district to rely more on property taxes and other revenue from the city’s general fund to pay for new initiatives and overhauls of failing schools. 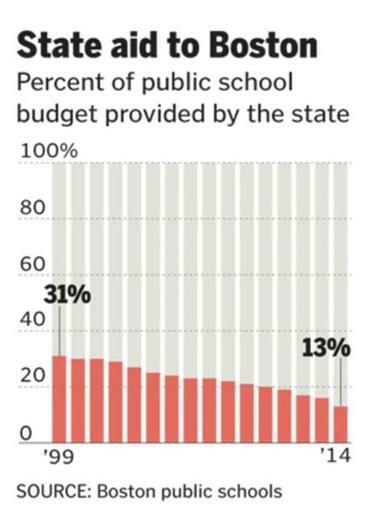 Just 13 percent of the public school budget this year is covered by state aid, according to a school system analysis. Fifteen years ago, such aid covered 31 percent of the city’s school budget. School officials anticipate that the downward trend — already more than a decade long — will continue. The Boston public school system has long been concerned about the amount of state aid it receives. The Massachusetts funding formula, developed under the 1993 Education Reform Act, works against Boston and many affluent suburbs that spend above state minimum requirements. Instead, it gives priority to districts that have fewer resources to fund education, such as those with small property-tax bases. But the funding formula explains only one part of the issue for Boston’s public schools. Compounding matters is the proliferation of charter schools in Boston, which operate independently of the school system but are funded almost entirely through state school aid designated for the city. That means that even though state aid has increased slightly for Boston, less of the money is actually going to the traditional school system. For instance this year, Boston’s public schools are losing a total of $87.5 million in aid to about two dozen charter schools. That leaves the public school system with $121.9 million in state funding, about $58 million less than what it received in 2008. About 7,500 Boston students attend charter schools, while 56,000 students are enrolled in city schools run by Boston public schools. Advocates for charter schools say the diversion of state aid to the charter schools only makes sense. “State aid follows the student; it’s hard to argue against that,” said Samuel Tyler, president of the Boston Municipal Research Bureau, a government watchdog funded by businesses and nonprofits. But even as the research bureau pushes for more charter schools in Boston, it is also raising concerns about the diminishing state aid for Boston’s public schools and the increasing reliance on the city’s general fund to support the public school budget. In November, the bureau released a report on the issue, urging the state to find way to provide the public schools with more money. Walsh’s initiatives include expanding early-childhood education, overhauling high schools, and bolstering career and technical training. It is unclear how the new mayor would pay for these new initiatives. Jeff Wulfson, a deputy state education commissioner, defended the way charter schools are funded. He said charter schools are supposed to be funded with a mix of state aid and local revenue. But to expedite the funding of charter schools, Massachusetts law simply empowers the state to give charter schools the full amount they need from their community’s state educational aid, enabling the district schools to keep all the local revenue. “It’s an accounting short cut,” Wulfson said. If anything, charter schools are underfunded, said Marc Kenen, executive director of the Massachusetts Charter Public School Association. He noted, for instance, that charter schools are prohibited from receiving construction aid from the Massachusetts School Building Authority. “There is no doubt that charter schools get the short end of the stick when it comes to funding,” Kenen said. Kenen also pointed out that Massachusetts school districts receive one of the most generous levels of state reimbursement in the nation to cover the loss of state aid to charter schools. But those reimbursements are only for a limited number of years and cover only a small portion of the state aid a school system loses to charter schools. In addition, the Legislature does not always fully fund the reimbursement rates. The prospects for changing the state funding formula for education aid — known as Chapter 70 funding — appear unlikely, observers say. Because of limited revenue, the state is still phasing in seven-year-old changes to the funding formula that place a stronger emphasis on a community’s property values, income, and student enrollments. Previously, the formula benefited districts that had historically underfunded schools, regardless of wealth. But the formula still creates wide variations in how much state aid covers a community’s “net school spending,” ranging from a low of 10 percent in districts like Tisbury, on Martha’s Vineyard, to more than 95 percent in Lawrence. McDonough said he can envision a day when all Chapter 70 money will end up at charter schools if more of them continue to open in the city. Charter school advocates are lobbying for unfettered growth of charter schools in Boston. “Unless there is a change in dynamic of funding, we need to think critically about how we fund public education in public school districts without state aid,” he said.